Primary tumors shed cancerous cells, known as circulating tumor cells, or CTCs, into the blood. These have been widely studied as prognostic biomarkers for various cancers. Because these cells are often larger, irregularly shaped and tend to cluster together, they get trapped in smaller vessels. To test this theory, UChicago researchers used an ultrasound-guided endoscope and a small needle to take blood from the portal vein during routine diagnostic endoscopies. They found CTCs in 100 percent of 18 patients with suspected tumors in the pancreas and bile ducts. 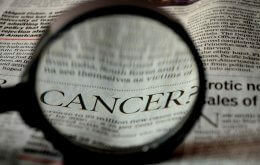 Tests using peripheral blood samples, the standard method, detected tumors cells in only four of the 18 patients. Only seven percent of patients diagnosed with stage II disease are still alive five years after diagnosis, making it one of the most lethal forms of cancer. The American Cancer Society estimates that in 2015, nearly 49,000 people will be diagnosed with pancreatic cancer and 40,560 people with this disease will die. “In the setting of localized cancer where these findings are most applicable, the additional information of portal vein CTC number and their molecular characterization may help predict who will benefit from aggressive therapy before surgery, who is most at risk for a recurrence after the operation and even who will not benefit from surgery at all,” said study co-author Daniel Catenacci, assistant professor of medicine. These hidden cells in the portal venous system could help cancer specialists make better clinical decisions. Molecular characterization of CTCs at the time of diagnosis or after neoadjuvant therapy can provide clues about each patient’s prognosis. The frequent loss of protective tumor-suppressor genes—such as TP53, SMAD4 and p16/CDK2NA, which are often inactivated in pancreatic cancer—correlates with a worse outcome. The National Institutes of Health, the Rolfe Pancreatic Cancer Foundation, Gerald O. Mann Charitable Foundation officers Harriet and Allan Wulfstat and the Live Like Katie Cholangiocarcinoma Foundation supported this work. Additional authors include Peng Xu, Ann Koons, Vani Konda and Uzma Siddiqui, all from the University of Chicago.